An antique piano bench can be a treasured heirloom, a prized piece of antique furniture or a cherished family item that brings back fond memories from earlier times. Old western movies often have a piano player sitting on a round three legged stool playing his piano in the town saloon. These piano stools of the old west were the early country cousins to the piano stools of the 1800s. Prior to the 1840s piano stools were either simple plain pieces of furniture, or made with heavily carved detailing and lion paw feet. The next decade saw piano stools with carved floral motifs, cabriole legs, and elegant serpentine shaped seats. Victorian piano stools from England and America were more elaborately made three legged stools with cushioned fabric seats. With the 1860s came the introduction of the piano chair. Early piano chairs had three legs similar to the piano stool and a sculpted and heavily detailed back. The rectangular wood framed bench seat, known as the piano bench, was a product of the 1870s. Many piano benches were made with a top that lifted giving the musician a storage compartment for his sheet music. Often the bench seats had covers with elegant designs of needlepoint or embroidery. The Victorian era had a very strong influence on piano bench styles all the way into the 1920s. Benches of the time often had delicately turned legs and beautiful glass ball and claw feet. Victorian duet stools were made with elegant carved detailing on the side panels and beautiful tapered square legs. 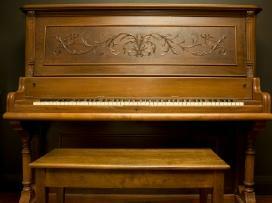 Throughout time, ever since pianos have been manufactured, piano benches have never been built by the piano companies. As a piano was being completed the company would send a description and specifications to a manufacturer of piano benches to complete the matching bench for the piano. Although there are many styles and designs of piano benches, there are only three basic piano bench forms. These forms are a concert bench, a rectangular bench and a piano chair. A standard wooden piano bench is rectangular in shape and can be made with a matching piano bench cover. This type of piano bench is a standard height and cannot be adjusted to different heights. A concert piano bench has circular knobs that are used to adjust the bench to different heights. Plush upholstery was used on the seats. The most uncommon type of antique bench for pianos is the piano chair. Aside from the fact that most pianists found them to be very uncomfortable, they were not offered as a standard choice with a piano purchase. Each leg style, whether hand crafted or machine made, complements the majestic musical instrument it accompanies. Just because you may not have a piano does not mean that you do not have a place for a piano bench in your home. They look lovely at the foot of a bed, in a hallway or as extra seating in a family room. An antique piano bench will look perfect in any home, regardless of the style of décor.